Syrian affiliate Nusra Front paves way for 'emirate' to rival ISIS's Raqa 'caliphate' headquarters; only second capital to fall. Al-Qaeda's Syrian affiliate and its allies seized on Saturday the city of Idlib, only the second provincial capital to be lost by the Assad regime in more than four years of war. The capture came as UN Secretary General Ban Ki-Moon expressed anger and shame at the world's failure to stop the conflict, reports AFP. More than 215,000 people have been killed since anti-government protests, which erupted in March 2011, were brutally repressed by President Bashar al-Assad's regime and civil war followed. The country has been ravaged by warring factions, including jihadist groups. The coalition that seized Idlib city is made up of Nusra Front, the official Syrian affiliate of Al-Qaeda, and several Islamist factions. 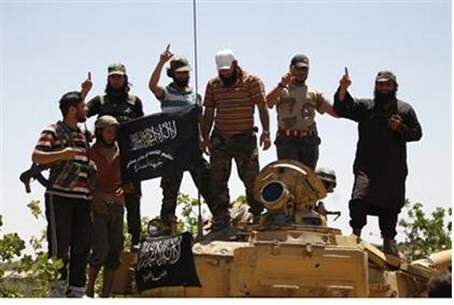 "Nusra Front and its allies have captured all of Idlib," the Britain-based Syrian Observatory for Human Rights said. "There is still a group of soldiers fighting in the security quarter of the city, but they will not be able to reverse the situation," Observatory director Rami Abdel Rahman added. The jihadist group also announced the capture of the northwestern city on its official Twitter accounts. "Thanks be to God, the city of Idlib has been liberated," it wrote. The group posted photos of its fighters in front of the governorate building, the city council, a local prison and a police station in the city. Earlier, a Syrian security source acknowledged that "terrorist groups had infiltrated the outskirts of the city," but state media did not report Idlib's fall. Official news agency SANA said only that "army troops were regrouping south of the city of Idlib in preparation to face an influx of thousands of terrorists coming from Turkey." The government has regularly accused Turkey, a backer of the uprising against Assad, of providing support and sanctuary to "terrorists," a term the regime uses for all opposition forces. The first provincial capital to fall was Raqa, in the north, which was seized by rebels in March 2013. The rebels were subsequently ousted by the Islamic State (ISIS) group, which has made Raqa the de facto Syrian capital of its self-proclaimed Islamic "caliphate" in Syria and Iraq. Around 2,000 Nusra and allied fighters took part in the battle, according to the Observatory, while the regime launched some 150 air strikes in a bid to hold off the attack. At least 130 people were killed in the fighting, according to the Observatory, which said some of the city's residents had fled. Around 200,000 people lived in the city before the conflict, but the population has swelled since with Syrians displaced from other areas. Idlib province as a whole is a bastion of Nusra, which ousted several rebel groups, including Western-backed organizations, from the region in November. That came after the group announced plans to establish an Islamic "emirate" in the area, which analysts say is intended to rival ISIS's "caliphate." Idlib's fall leaves the regime with few remaining strongholds in the province, which borders Turkey. Government forces are still present in the cities of Jisr al-Shugur and Ariha, a few small localities, the Abu Duhur military airport and five military bases. Idlib's capture came as the UN's Ban spoke of his disappointment over the continuing death and destruction. "I confess to you my anger and my shame," he told an Arab summit in Egypt. "Anger at observing the Syrian government, extremist and terrorist groups and terrorists relentlessly destroy their country." "Shame at sharing in the collective failure of international and regional communities to decisively act to stop the carnage that has afflicted the Arab brothers and sisters of Syria."